Professor Davidson and his lovely daughter Diana search Africa for the Lost City of Zoloz. Legend pegs it to be the source of a vast hidden treasure. Their search is hindered by a local crook, Singapore Smith, who wants the treasure for himself. It is further complicated by Dr. Bremmer, an international criminal, who plans to destroy the peace with the local native tribes and build a secret air base at Zoloz. Fortunately, the Phantom, who is also Diana’s fiancé, is more than a match for the two villains. 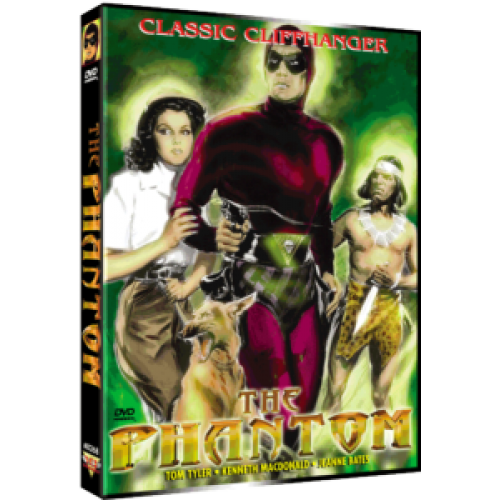 The Phantom, with his superhuman strength, manages to outwit each enemy move, escaping from one death trap after an other: avalanches, poison gas, flaming pyres, and explosions fail to shake his fearless spirit. With the help of his four-footed pal Devil, he finally overpowers all the enemy factions, and brings peace to the jungle once again. Another exciting serial adventure produced by Columbia Pictures and based on one of King Features’ funny-paper heroes.